An education leader relates how his experiences with the civil rights movement led him to develop programs promoting educational success in science and technology for African Americans and others. When Freeman Hrabowski was twelve years old, a civil rights leader visited his Birmingham, Alabama, church and spoke about a children’s march for civil rights and opportunity. That leader was the Reverend Martin Luther King Jr., and that march changed Hrabowski’s life. Until then, Freeman was a kid who loved school and solving math problems. Although his family had always stressed the importance of education, he never expected that the world might change and that black and white students would one day study together. But hearing King speak changed everything for Hrabowski, who convinced his parents that he needed to answer King’s call to stand up for equality. While participating in the famed Children’s Crusade, he spent five terrifying nights in jail—during which Freeman became a leader for the younger kids, as he learned about the risk and sacrifice that it would take to fight for justice. Hrabowski went on to fuse his passion for education and for equality, as he made his life’s work inspiring high academic achievement among students of all races in science and engineering. It also brought him from Birmingham to Baltimore, where he has been president of the University of Maryland, Baltimore County for more than two decades. While at UMBC, he co-founded the Meyerhoff Scholars Program, which has been one of the most successful programs for educating African Americans who go on to earn doctorates in the STEM disciplines. 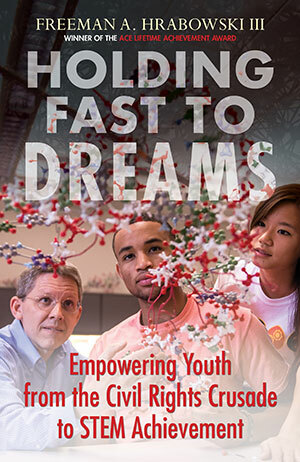 In Holding Fast to Dreams, Hrabowski recounts his journey as an educator, a university president, and a pioneer in developing successful, holistic programs for high-achieving students of all races. —Dr. Robert P. Moses, President and Founder, The Algebra Project, Inc.